Much of the focus on Beirut has dealt with its relative stability, especially considering its recent history. Now the debate needs to move on how to get it functioning like the world-class city it once was, and that means better urban planning. Duck under the Corniche railing and skitter down the gravelly trail. It smells faintly of urine — hardly a surprise: There are no public toilets here. Why would there be? This isn’t a public space. Yet, the dusty expanse beneath is litter free. Minet al-Dalieh, the undeveloped promontory that juts out into the Mediterranean just south of the Pigeon Rock in Raouche, perhaps provides the truest example of a utilized public space in Lebanon’s capital. In spring and fall, the rugged brown central area, which is surrounded by rocky dunes on three sides, is a chaos of youths bouncing precariously on horseback and ATVs growling up and down the rough terrain as entrepreneurial types sell rides. Makeshift cafes offer snacks and beverages, and a descent to sea level reveals small, motored boats eager to take tourists for a spin out beneath the freestanding Pigeon Rock. In summertime, rising temperatures sap wannabe cowboys of their flair for mounted hijinks and drive Dalieh’s visitors coastward in pursuit of a dip in the sea followed by a sunbathe on the rocks. Among the regular frequenters of Dalieh is Abir Saksouk-Sasso, an urban researcher and architect, who when asked to participate in a panel discussion during the recent Hay Festival in Beirut, used the opportunity to discuss the capital’s public spaces with specific reference to Dalieh. Prefacing her talk by revisiting Beirut Mayor Bilal Hamad’s stated reasons for keeping Horsh Beirut, the city’s largest park, closed to the public, Saksouk-Sasso cast Dalieh as a counterpoint to his argument. Beirut’s closed public park. Photo by Steven Damron. Analyzing Hamad’s motivations, Saksouk-Sasso argued: “The ‘public’ is seen only worthy of this space if it behaves according to a classed understanding of what an acceptable public might be. “Public space, according to Hamad, is a park uninhabited, sterile, and it needs to retain this same image. Any presence of diverse social groups would act as a threat to his perceived image of the park,” she added. For Saksouk-Sasso, Dalieh is the unpredictable representative of just that perceived threat, yet as a public space it flourishes. Nowroz is the Zoroastrian festival of New Year. It is widely celebrated by Kurdish populations around the world. At Dalieh, flag-waving crowds picnic together and listen to music to mark the occasion. The festive celebrations made Saksouk-Sasso aware that Dalieh “is a major public space in the city.” And given that Beirutis “nag all the time about lack of public space” she looked into the area further. 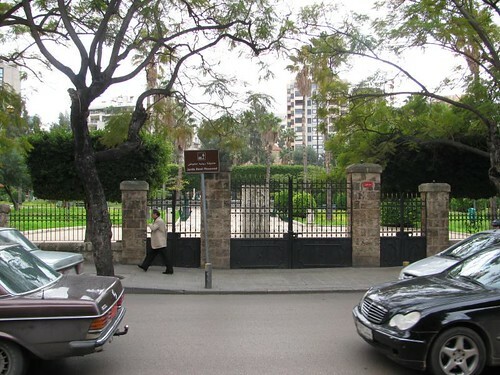 The researcher discovered that the space had been held historically by multiple private owners, but more recently the land was bought by a real-estate company belonging to assassinated former Prime Minister Rafik Hariri. She sees this acquisition of the land as a threat to the public claim to the space. However, she explained, as the public legally has a right to pass through the land to access the sea, it is unlikely they could be prohibited from entering the area. But while small individual owners are prohibited from building on more than 1 percent of a seafront property, Saksouk-Sasso explains that a 1995 zoning amendment allows companies to exploit 20 percent of seafront plots in this way. She fears the Dalieh site will fall victim to a development similar to the neighboring luxury, and exclusive, Movenpick resort. “The site of Movenpick was owned by multiple owners, yet part of the public seafront areas. It [was] only when it was bought during the late ’80s by a multimillion real-estate developer who has political backup that he was able to get an ‘exemption’ to the law, and basically was able to do what Movenpick is today,” Saksouk-Sasso told The Daily Star. However, the Itani family, longtime operators of one of Dalieh’s snack kiosks and providers of fishing, diving and boating trips, harbors no anxiety about the area’s imminent development. Misbah Itani, who runs the place with his brother Mohammad, says he and his fellow fishermen and shack operators are unlikely to be moved. Hani and his wife Natalie, who are currently visiting from London, describe the area as attracting a wide range of people, both locals and tourists alike. Sitting in the sunshine prior to heading out on a fishing trip, Natalie explains that the couple visits Lebanon every two years. “More shacks have gone up as the years have gone by,” she observed, before eagerly highlighting the role the area’s fishermen play in aiding those who get into trouble in the waters around the Pigeon Rock. A favorite family story is how 10 years ago Misbah managed to retrieve a $10,000 watch a Saudi Arabian visitor lost while diving. In general, Dalieh is quiet on a midweek afternoon in July. A cart sells corn by the entrance. Two boys sit chatting in the dunes. In the open space beneath, a couple walks hand in hand. Closer to the water, a woman sits beneath a palm-frond shelter endeavoring to entice visitors into a boat ride. Behind her, the Itanis’ cafe sells cool beverages. Two Syrian women with their daughters drink water. They have been coming here every day of late. A large cage is full of cooing birds, while by the snack shop’s entrance a monkey romps, apparently unperturbed by his small cage. Down by the water, families splash in the sea or soak up the sun on the rocks. Unlike at Zeitounay Bay, there is no signage here detailing a list of unacceptable behaviors. Yet, while Dalieh is clearly a far more rustic coastal environment, the absence of a formal set of rules does not appear to have resulted in chaos. “I believe public space is unpredictable by definition,” Saksouk-Sasso said.